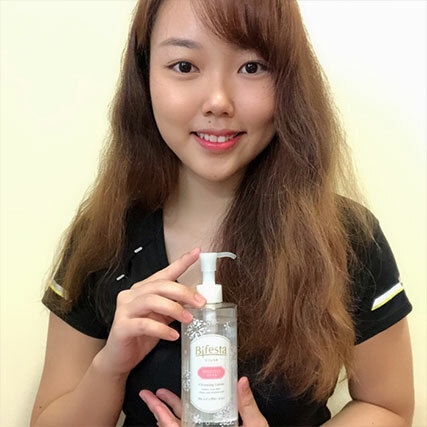 Bifesta might be one of the familiar names out there when it comes to make-up removal products and they’ve recently launched a new variant for their micellar cleansing lotion targeted at sensitive skin. 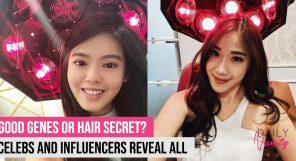 Think of the haze that comes by Singapore every few months and the air conditioning in the office that blows directly onto your face, we city folks are constantly exposed to harsh environments that stress our skin out. The new Bifesta Sensitive Micellar Cleansing Lotion targets ladies like us, providing delicate care while removing makeup. Although it is gentle on the skin, it does not compromise on its effectiveness in removing makeup. Free from harsh chemicals, oils, fragrance and alcohol, it doubles up as a moisturiser with hyaluronic acid and protects skin from external stimuli with skin protecting ingredients. 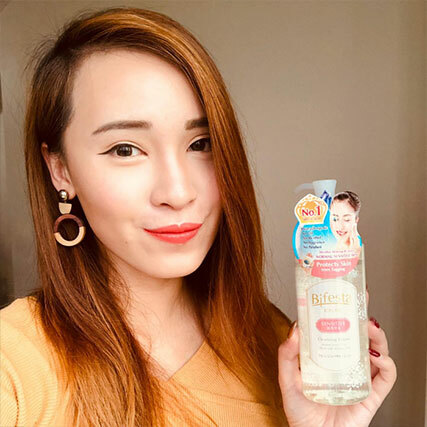 To find out how gentle and effective the new Bifesta Sensitive Micellar Cleansing Lotion is, we got our writer and 20 Daily Vanity readers to review the product and share what they think about it. 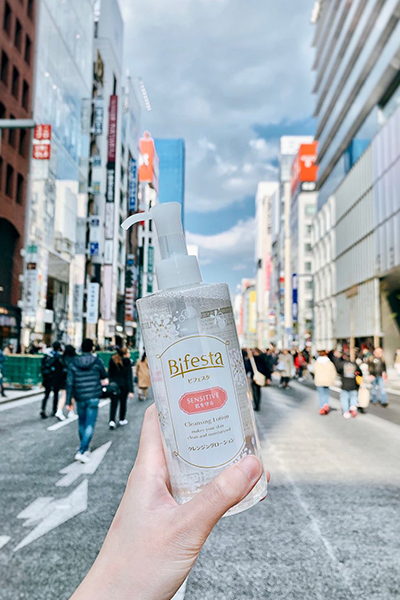 The Bifesta Sensitive Micellar Cleansing Lotion retails at SGD18.90 and is available at all major drugstores, supermarkets and department stores. I’ll be honest, when it comes to makeup removal, oil cleansers are the only thing that worked for me so far without leaving my skin dry and tight. Blame this on my dry skin, it always makes it challenging for me to find the right cleansing product. As I’ve been very comfortable with my usual cleansing products, I’ve never tried any other types of makeup remover before this, so a lotion cleanser was something very new for me. 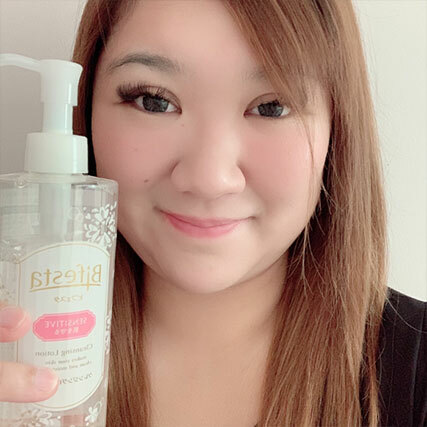 In comparison to other products I’ve used, I’d say the Bifesta Sensitive Micellar Cleansing Lotion did a really great job when it comes to removing all the base makeup off my face, without stripping it of moisture. 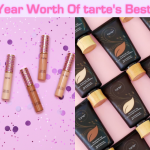 In fact, to put it through an even more rigorous test, I pitted the cleansing lotion against a waterproof mascara and some glitter eyeshadows. 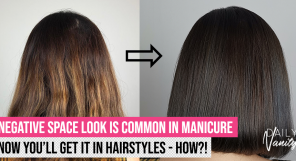 It is common knowledge that these types of makeup are usually rather stubborn to remove, and typically takes me two rounds of cleansing to get everything off. So this is definitely a good litmus test of its overall effectiveness. 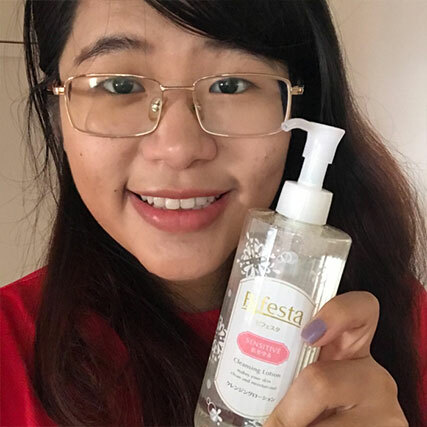 And the results are out: the Bifesta Sensitive Micellar Cleansing Lotion removed the mascara and most of the glitter rather easily without leaving my dry skin feeling tight. 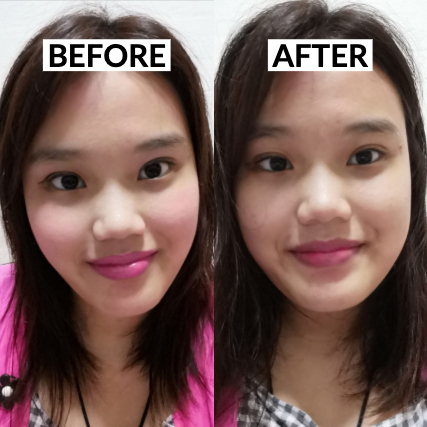 I certainly liked how effective it was in removing all the different types of makeup, from my base makeup, intense eyeshadow, waterproof mascara, to even the lip tint. While it did take me a while to remove every trace of glitter (we all know how tough it is to remove glitter! ), I’m still pretty impressed and it definitely outperform my expectations in its cleansing power for a water-based cleansing lotion. 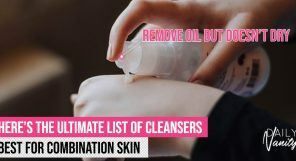 Especially for my dry skin, it is important that the cleansing process is not too harsh or drying for my face as I’ve had past experience with other brands of makeup removers that made my skin peel. 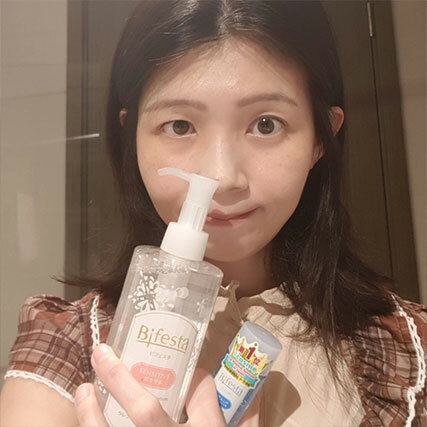 So I definitely liked the way the Bifesta Sensitive Micellar Cleansing Lotion made my skin feel. Not only is it gentle and does not strip off the moisture on my skin, but it also leaves my skin feeling clean, refreshed and moisturised after using. 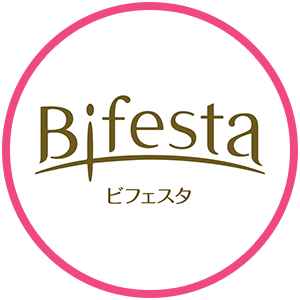 Bifesta is the leading micellar water brand in Japan with a full-range of cleansing products, from micellar cleansing lotion, makeup remover wipes to carbonated facial foam. 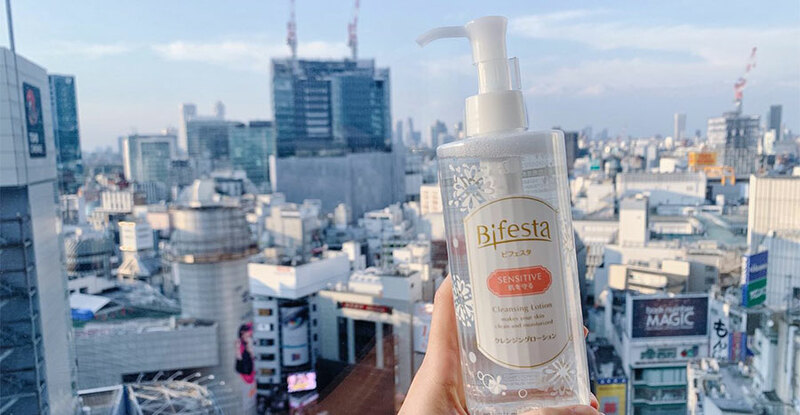 The latest addition to their popular micellar cleansing lotion range is the Bifesta Sensitive Micellar Cleansing Lotion, a gentle formula for people with sensitive city skin. Most reviewers love how the Bifesta Sensitive Micellar Lotion was able to remove light to heavy makeup without much effort. Many are impressed at how their skin still feels moisturised even after cleansing without leaving the skin either too dry or too sticky. 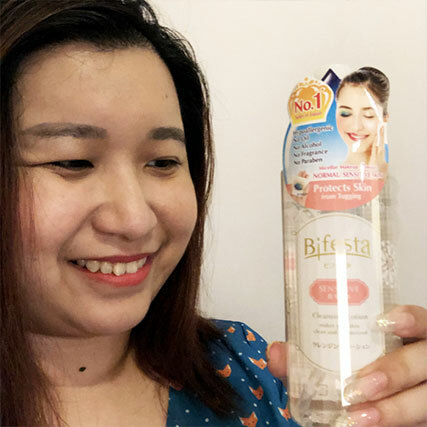 Reviewers with sensitive skin also felt no irritation when using the Bifesta Sensitive Micellar Lotion and liked how comfortable it felt on the skin, leaving no tugging feeling. Click to see reviews regarding how gentle it is on the skin. 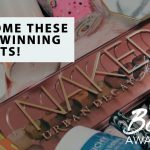 I was surprised at how easy it was removing my makeup with the product and even more at how gentle it was. Usually after using makeup wipes or remover, I get this slight tingly feeling on my face, but this product felt like water on my face and that’s a real takeaway feature for me. After a few days of usage, I noticed my pimples around the side nose, forehead and lips were gone. My boyfriend also mentioned how soft and clean my face became without makeup. The need to wipe excessive oil off my face has decreased as well. Also, I love how cute the packaging is. The lotion removes light makeup quite well and is moisturising. I’m more used to oil-based makeup removers but this lotion actually worked, which was surprising to me. I love how gentle it felt on my skin. Super comfortable! 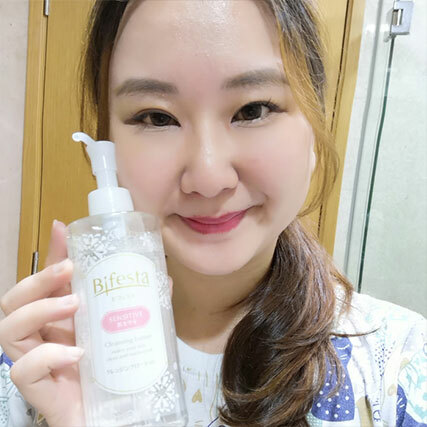 The Bifesta Sensitive Micellar Cleansing Lotion was comfortable and moisturising on my skin, and does a decent job in removing both light and heavy makeup. I like that it’s able to give a thorough cleanse without leaving a “tugging” feeling on my face, but instead makes my face feel moist. 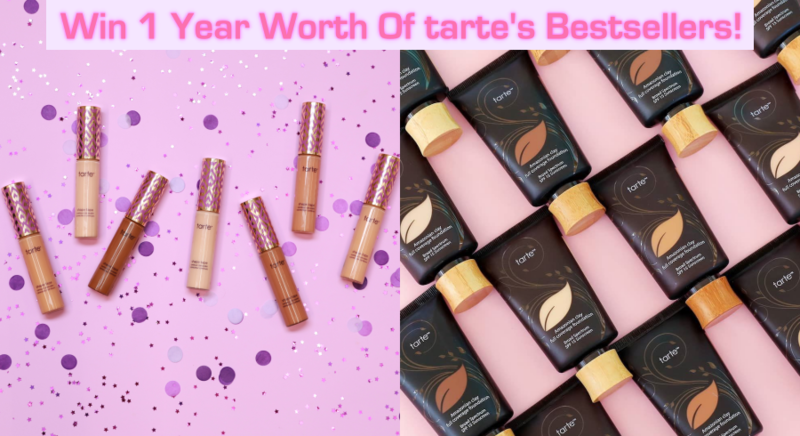 I’ve always been hesitant to try out new products as my skin is really sensitive. 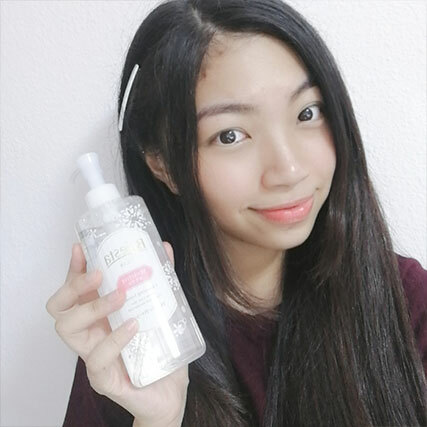 I’m glad that the Bifesta Sensitive Micellar Cleansing Lotion was very gentle and did not irritate my skin, although it got a little bit painful when it came in contact with my eyes. Overall it’s a good product! It doesn’t leave my skin feeling oily and I felt refreshed after using it. I would say it’s worth a try! The texture of this lotion is smooth and glides easily over my skin to remove my makeup. It’s very gentle and easy to rinse off, leaving my skin feeling moisturised, without any tight feeling. I would recommend my friends to try this! Oily skin, concerned about blackhead, whitehead, pimples and pigmentation. 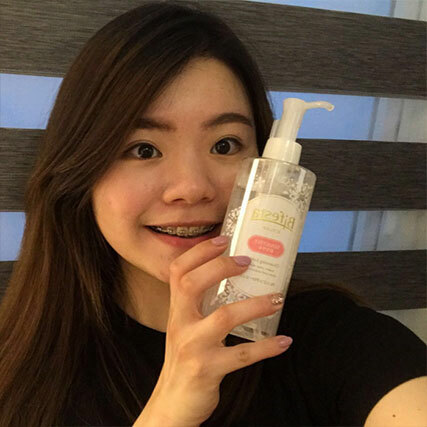 The Bifesta Sensitive Micellar Cleansing Lotion is a great product that removes makeup easily. 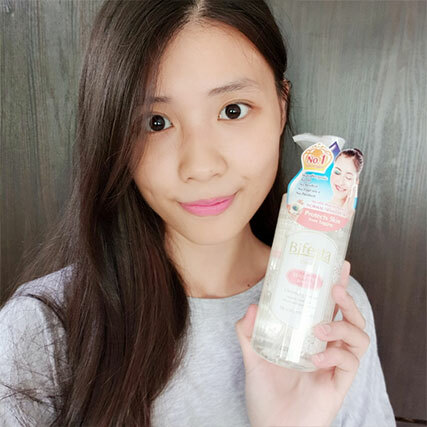 It is very gentle yet effective and I didn’t feel the need to rinse my face after using the micellar lotion, unlike when I use other cleansing creams or wipes. What’s more it doesn’t sting the eyes like other popular micellar waters! It is a great remover for those with sensitive skin as it contains no fragrances and alcohol! The lotion is very light and does not dry out the skin too. I like that it is gentle yet very effective in removing daily makeup. It doesn’t leave a sticky sensation on my skin. It makes my skin feeling refreshed after cleansing, which is a plus for me! Click to see reviews regarding how effective it is in keeping the skin mosturised. I’ve always been using cleansing oils and makeup removing wipes. This is the first time I’ve used a product like this but found it pretty easy to remove makeup with this lotion. The product was easy to use and my skin did not feel tight or uncomfortable after use. Instead, it felt refreshed and moisturised. The lotion is non-greasy, removes makeup easily, and gave me a refreshing feeling. 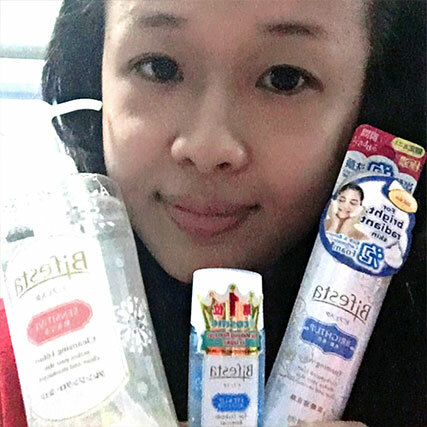 I could feel that my skin is cleaner and clearer since I started using this product. 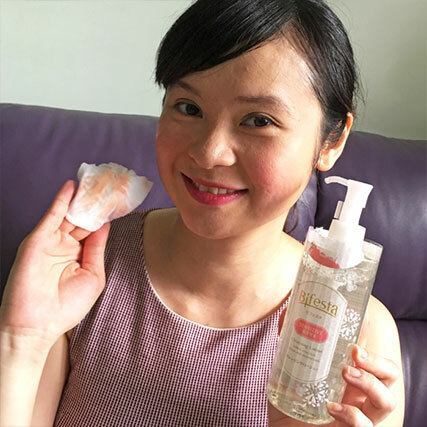 I’ve previously tried the Bifesta Moist Micellar Cleansing Lotion and found it a little sticky. Thankfully, this one from the “Sensitive” range is different. On days when I’m feeling really lazy, I could just go without washing my face after using the lotion – making it a great option for quick cleansing. Just a little product is needed to remove makeup from my entire face, and I like that my skin doesn’t feel tight after using the lotion. 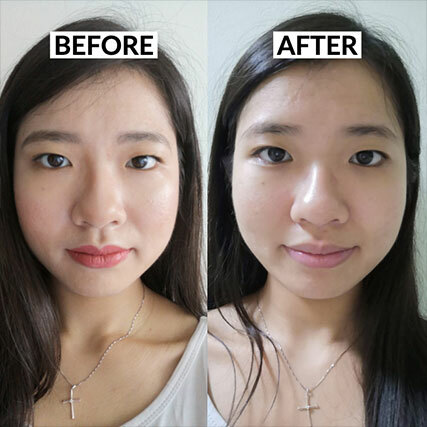 It’s really effective and efficient in removing makeup and kept my skin moisturised! I’ve always preferred scented makeup remover but this remover smells just right. I actually even feel de-stressed after using this product! 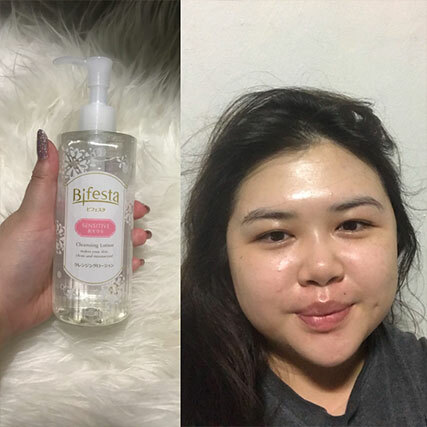 The Bifesta Sensitive Micellar Cleansing Lotion was easy to use and it did not dry out my skin or cause any allergic reaction. I find it very moisturising and refreshing. 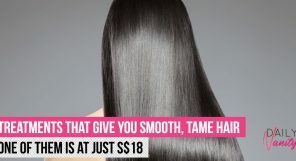 It’s great for ladies on the go! No time for double cleanse? Use Bifesta Sensitive Micellar Cleansing Lotion as an alternative. It is also moisturising enough and didn’t leave my skin feeling tight. I usually use oil-based removers and makeup wipes for my usual routine, and it’s the first time I try a lotion cleanser. I like that this product is quite moisturising and leaves my skin feeling refreshed. 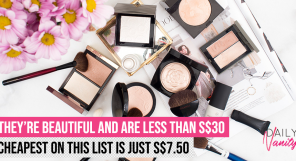 It is also easy to use and removes light makeup effortlessly. 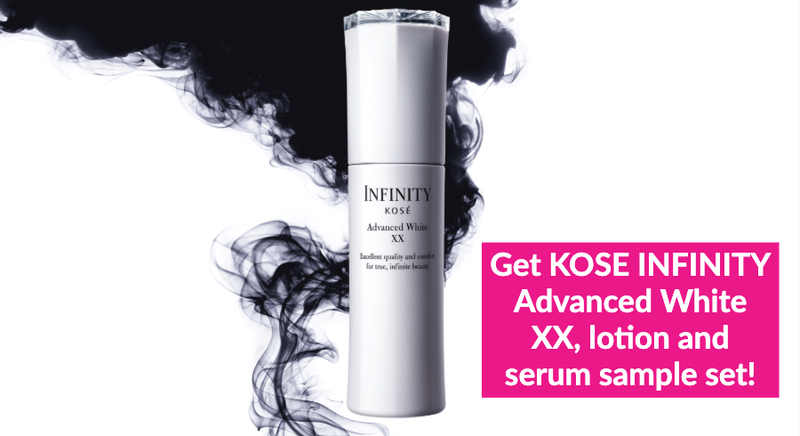 Combination skin, concerned about blackhead, whitehead, texture of skin and pigmentation. I love how gentle yet effective it is! Definitely worth buying! I really like how well it cleanses and how it doesn’t leave a sticky feeling afterwards. 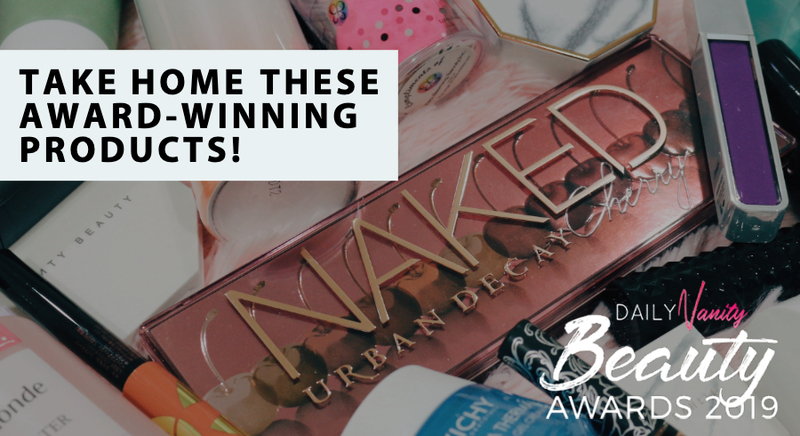 I feel like I can go to bed straight away after using it without washing my face again – perfect for lazy nights! Perhaps some relaxing scent can be added, and it’ll be even more ideal to use at night. 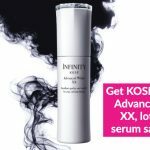 Click to see reviews regarding how effective it is in removing makeup. Combination skin, concerned about acne, bumps and enlarged pores. I love how easy the pump works and how it is very effective in removing makeup – even waterproof mascara can be easily removed with it. As I have concerns with visible pores, I’m glad that the lotion does not dry my skin out and my skin felt very refreshed and moisturised after using it. 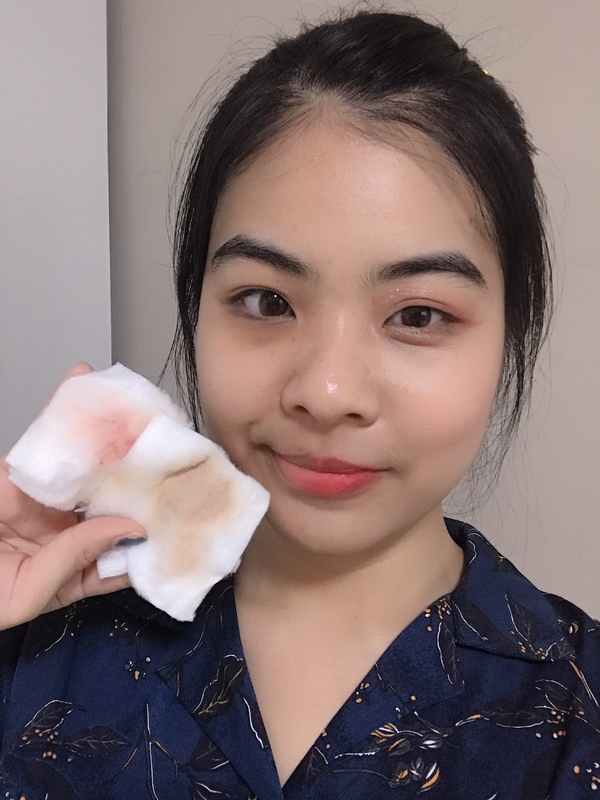 The product works well to remove makeup and I was even able to remove eye makeup with this! The texture is light too, leaving my skin moisturised and refreshed after using. However, the pump seems to be too strong and too much product squirts out when I was using it. 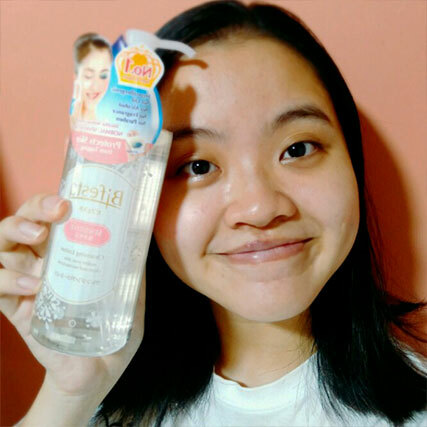 This is a good and affordable cleansing product as compared to other micellar waters I’ve tried before. It does a good job and I have no complaints at all. It’s very good for lazy people like me, as I like to simplify my routine. With this, I can get my makeup off fast without extra cleansing again. Plus, I use it as a toner as well so it’s killing two birds with one stone. 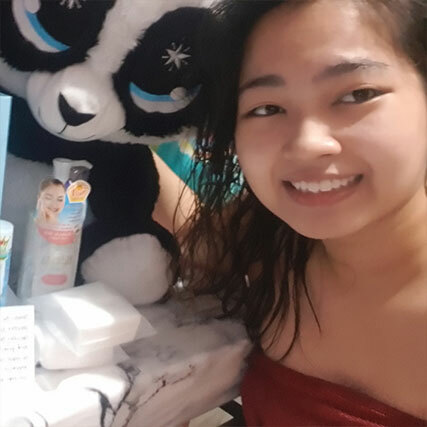 I was able to achieve clean skin and doesn’t leaves my skin feeling oily at all. Best of all, no tugging feeling! I absolutely love its mild but powerful cleansing properties! Makeup comes off so easily with this and it leaves a very good feeling on my skin after removing makeup! As I have eyelash extensions, I’m always very careful when I remove my eye make up, but this worked well and it was a total breeze to remove my makeup, even with my extensions. 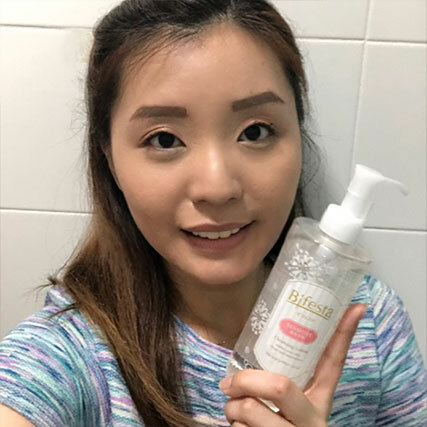 I have dry skin and have always been using oil-based cleanser, I’m glad that this product did not leave my skin feeling tight after cleansing. This is one of the best makeup removers I have tried yet is so affordable – it’s definitely value for money. 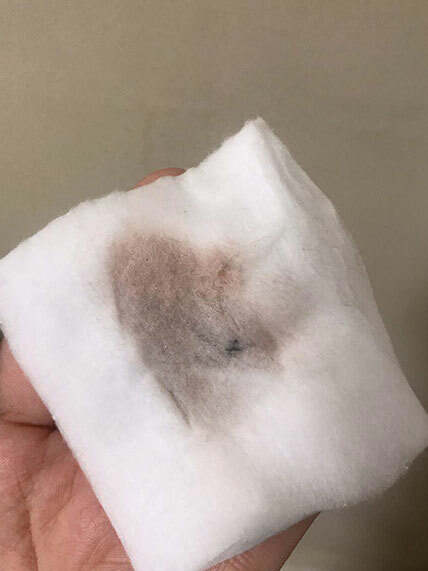 It is very effective in removing makeup – I could remove all my makeup within a few wipes. It also leaves my skin feeling smooth and moisturised. I would like to see it in a travel size, which will be useful to people who travels a lot!